Demon the Descent is the ninth major expansion to the World of Darkness, and the first since the introduction of the revised core rules in The God-Machine Chronicle. In fact, Demon the Descent is an extension of The God-Machine Chronicle’s setting, another facet of the twisted mechanical machinations of the God Machine and its servants. The Quickstart was written and developed by Matt McFarland and it provides an excellent introduction into the new game as well as the new rules. Players adopt the roles of the Unchained, former angelic minions of the God-Machine who have forsaken their functions and fallen. These newly formed demons must cope with their new existence, not wholly angel or human, while at the same time hiding from the God-Machine and/or finding ways to oppose it. Angels are organized into one of four broad categories called Incarnations, and after the fall the demon retains these features. These include the Destroyers, Guardians, Messengers and Psychopomps. Angels are creatures of divine purpose but demons find themselves stripped of their purpose. This creates a void within the demon, and each adopts an Agenda to fill that void; the Inquisitor, Integrator, Saboteur or Tempter. Although the demon can perceive the gears of the God-Machine and the ancient laws that govern reality, it no longer possesses the intuitive understanding of those laws. Instead, it uses the few memories it retains of those laws, called Embeds and Exploits, to change reality in subtle ways. Each demon hides themselves behind a Cover, their ‘human’ mask, but they can reflexively reveal their demonic form, shaped by seven form aspects, at the risk of drawing the attention of the God Machine. 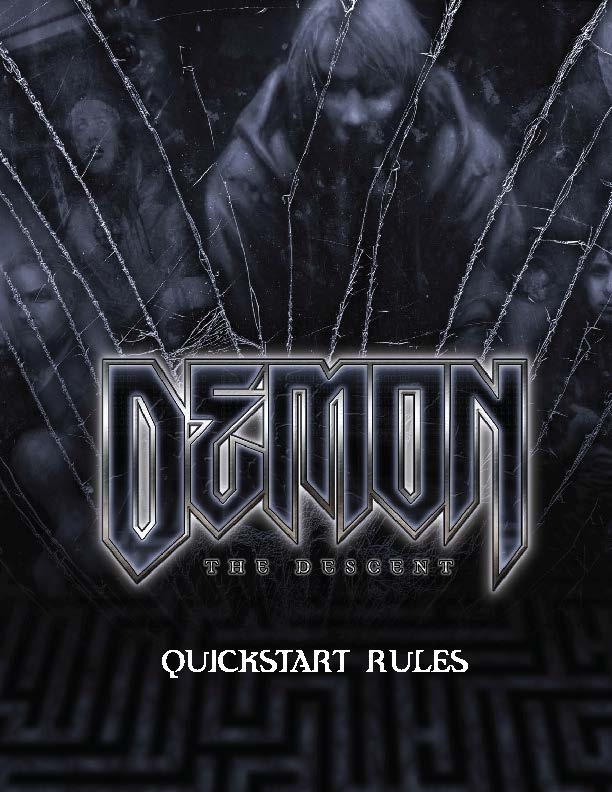 The Quickstart includes four demonic characters and all the rules you need to portray them as well as a complete scenario to play through called “Honey & Vinegar.” This scenario can be a standalone story or it can easily fit into an ongoing chronicle. Demons utilize the ‘waste heat’ of the God-Machine, called Aether, to fuel their powers. The God-Machine has created an Infrastructure to reclaim Aether for its own purposes, but it requires demons through which to filter the power source. The project is nearly complete and it is time to find those demons. Oh look! PCs coming this way. Although the Quickstart Rules provide everything you need to start playing, it is but a glimpse into the countless goodies Onyx Path Publishing has packed into the full game. Demon the Descent is tentatively scheduled for release sometime this month. Notice the bold word in the previous sentence. OPP’s new business structure includes a strong dedication to the highest standards of quality, and while they always try to hit their marks, sometimes a product slips in order to maintain that level of quality. If this product looks interesting to you, drop by DriveThruRPG and pick up a copy for yourself. It is available in both PDF (free) and Print on Demand (for a small printing and shipping fee). Stop back by and let me know what you think of it.